From brunch to teatime, for young and old, Sweet and Savoury Pâtes presents 50 recipes of delicious and innovative sweet and savoury spreads to make at home.From her tiny kitchen in Paris, Rachel Khoo has revolutionised the way we think about French food with her bestselling book and TV series, The Little Paris Kitchen.Rachel brings her innovative blend of creativity and style to the home kitchen to show you how to make a variety of spreads to serve as a snack or a main course. From a nutty pâté, fruit curd and lots of clever ideas for chocolate and caramel, this unique collection of recipes provides the homemade, healthy alternative to all of your favourite spreads. The bestselling author of The Little Paris Kitchen departs France on a brand new culinary adventure. Out and about, she finds the most delicious fare, recording it all in her kitchen notebook. 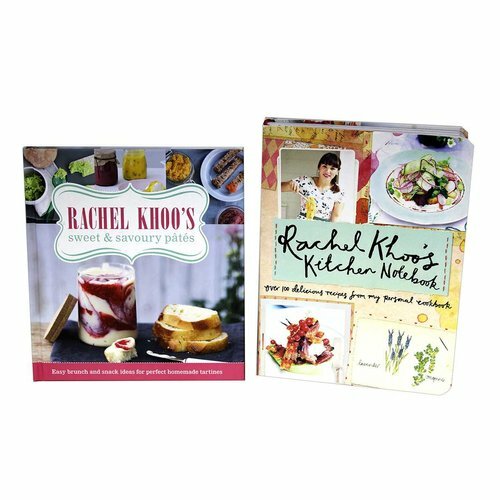 From a Ham Hock Tiffin Box to Slow Roasted Pork Belly with Sloe Gin, and Rhubarb and Custard Millefeuille, Rachel Khoo's Kitchen Notebook will inspire even the most jaded cook to try something new.Her latest cookbook is packed to the brim with 100 standout recipes, full-colour photography and Rachel's very own sketches of the food and places she encounters.